Canon G5X is a little bit more expensive than Canon G7X, available at a price point only a step higher up. These two products are both mirrorless cameras that are relatively affordable, yet they also offer top-notch performance that you can count for professional photography purposes. So, what does Canon G5X bring with the price increment? Which is the model that holds the fullest value for the money? You can answer the questions after reading the article below. Both Canon G7X and Canon G5X are utilizing the same 24-100mm F/1.8-2.8 zoom lens that is capable of providing a maximum optical zoom of 4.2X. They both are already armed with optical image stabilization. They perform an excellent job in compensating handling vibrations and reducing blurs, even on zoom, ensuring sharp and crisp images. Both of these two models also make use of the same 20 MP 1.0” BSI CMOS image sensor, with 125 – 12800 ISO range. However, Canon G7X actually has a slightly faster continuous shooting speed with 6.5-fps photo burst, as opposed to Canon G5X’s 5.9-fps. In addition, Canon G7X comes with a built-in ND filter, which reduces the amount of light coming into the camera so that you can set longer exposure times and wider apertures. On the other hand, as mentioned above, Canon G5X holds the advantage of having an integrated electronic viewfinder. It also comes with an external flash shoe that you can use to connect an external flash. There is also the AE Bracketing feature added, which is a very powerful feature for HDR photography and shooting in a tough light condition. Both models are great. 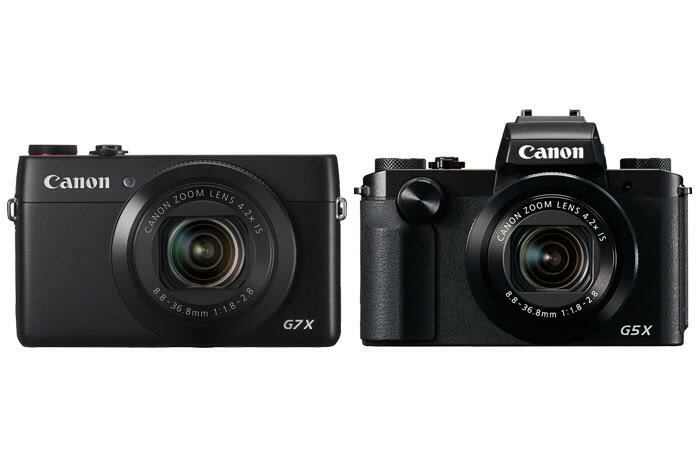 If you don’t have the necessity of having a viewfinder, you can choose Canon G7X to save some money. Otherwise, for better control and framing from the electronic viewfinder, Canon G5X is the way to go.